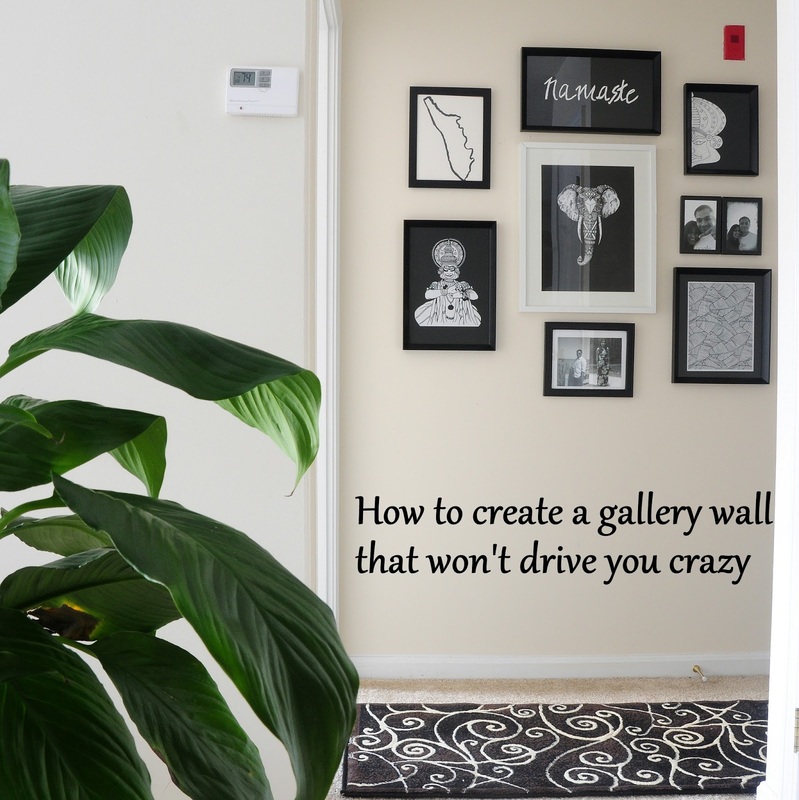 HOW TO CREATE A GALLERY WALL THAT WONT DRIVE YOU CRAZY - HIP HIP HOME! While I love eclectic gallery walls, only after being in a long-term relationship with one did I realize that it was just not for me. I think there was too much going on - too many frames, shapes and colors. In short, it was too dramatic for me to handle. So one day I lost my mind and broke up with it. Soon we revamped the living room and it got itself a less dramatic piece of art. See it here. I did however figure out a way to enjoy my gallery wall without the fuss. If you love eclectic gallery walls but think they are too busy for you, here is a possible solution you can try. Here is my new gallery wall. The first thing you notice is probably the black and white color scheme. The monochromatic color scheme keeps it from looking too cluttered, don't you think? It doesn't always have to black, as long as there are a few colors unifying the gallery. Secondly, I used it in a hallway that connects our bedrooms, so it is partially hidden from sight. We spend most of our time in the living-dining-kitchen area, so only occasionally do I catch a glimpse of the gallery wall. I appreciate it much more, since it is not in my face every time. An office, an entry, a hallway are all good candidates in my opinion. I use it to display a map of my home state Kerala, an elephant, Kathakali - a form of cultural dance, and also a few photographs. It reminds me of India. The art is either thrifted or something I made. There are also a few free printables in there. Did you know that you are free to use images from Pixabay under the Creative Commons license? I will probably change it somewhere down the line, (who am I kidding) but for now it lives happily in this hallway, out of sight, but still in my mind. I absolutely love gallery walls , but for some reason it got to me after a year. I enjoy it so much more now, tucked away. I'm so glad you stopped by! Btw, haven't seen you around on IG lately. Hope everything's well. Glad to hear all is well! Of course, family first!